Rafa Benitez has named an unchanged side to face Tottenham at Wembley. Newcastle boss Rafa Benitez has named an unchanged side for today's fixture with Tottenham at Wembley - and United fans are feeling confident ahead of the game. 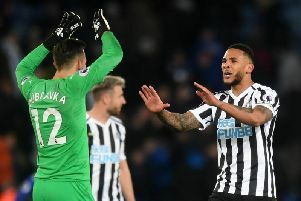 The Magpies caused a major shock by defeating Premier League champions Manchester City last time out, while the record signing of Paraguay intentional Miguel Almiron and loan arrival of defender Antonio Barreca has eased the unrest on Tyneside. Almiron isn't available to face Mauricio Pochettino's side as he is still awaiyting his visa, while Barreca may make his debut off the bench. But while Magpies supporters are genrally happy with Benitez's starting XI, there are some concerns about the bench. @Thegeordiefaith: No reason to change it up in truth, get at them boys!!! @blackster_2008: Why change a winning team. I would take a point but a win would be nice. The pressure is on spurs. @IanSolo75: No need to change a winning team but if Atsu doesn’t get off to a flyer then bring in Barreca ( what we bought him for ) and move Ritchie up! Other than that good luck lads! @Stezza_Dozza: 4 defenders on the bench. only potential game changer is kenedy. Hopefully the game won’t need changing.